At last year’s InfoComm, WyreStorm refocused business and market strategy into the three distinct segments: WyreStorm Pro AV for the commercial sector, WyreStorm Installer Solutions catering to the CI market, and WyreStorm Express aimed at retail or end-user channels. WyreStorm’s ability to combine technologies enables both single-platform and hybrid systems to be created that can be perfectly tailored to applications for true one-manufacturer solutions, offering much more than just a feature set that further distinguishes the brand from the competition. Simply put, their goal is to allow the pro AV integrator to utilize the best technology for a given application for an unrivaled installer/user experience. This year, at InfoComm 2016, the WyreStorm booth will aim to bear witness to the fruits of that labor with new AV signal distribution and control solutions for the pro AV market that illustrate the company’s focus on installer/user experience and products aimed at providing specific solutions for pro AV markets. Expanding its NetworkHD line of AV-over-IP products aimed at hospitality applications such as bars and restaurants, corporate, and retail, the NetworkHD 100 and 200-Series gets a new multi-view 4K decoder capable of displaying up to eight simultaneous video feeds on a single screen in a variety of configurations with 4K scaling enabling four images to be displayed in their native 1080p format. 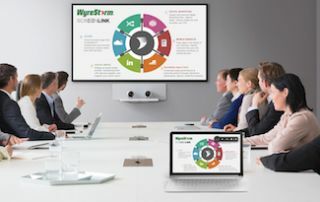 A two-hour seminar is also being run by WyreStorm’s Martha Brooke on June 8 at 3:00 p.m. on the benefits of AV over IP for increasing profitability in bar and restaurant markets. For an enhanced NetworkHD-user experience, the line also gets intuitive new drag-and-drop control for iPad in the form of Touch. Putting control of entire NetworkHD systems at a user’s fingertips, Touch allows drag-and-drop instant source selection onto screens with live video preview of all selections and sources on the iPad screen and seamless compatibility with WyreStorm’s Enado control solution for source control and BYOD support. On the subject of Enado, the new V4 update of WyreStorm’s control solution adds hundreds of new features to the Enado and Enado Mini controllers to further improve both dealer and client experience with the WyreStorm installation. Among others, new additions to Enado V4 include the launch of iOS and Android apps within Enado itself, with a growing list of supported apps, such as Lutron, Nest, Spotify, Sonos, Nuvo, CasaTunes, and many more. Configuration of dynamic DNS has also now been eliminated with the addition of Enado Permalinks. V4 also now supports IFTTT and Amazon Echo integration, and the expansion of QR codes to include both room and activity and hide/show functions for greatly improved activity layout button customization and functionality. The WyreStorm range of Presentation Switchers expands to include a new HDBaseT model for WyreStorm’s multiview PiP 4x2 scaler/switcher with dual 4K output, aimed squarely at providing further AV solutions for bars and restaurants.